City curbs - best way to create them in BTB? Discussion in 'Bob's Track Builder' started by nothke, Jan 31, 2011. Hay boys and girls, I am having decision problems on how to make effectively high city curbs in BTB, and what are your experiences with those? or just put a curb looking wall in between? In "my" top option - road material/texture stays the same and I could use couple more pictures just for the roadside panels - smaller textures etc. Adding Walls would produce more polygons to render/calculate and it could be difficult to fit/position them to road/terrain. i also used option 1 in my 15 mile track. This is nice method, BUT the problem is that I am making a street circuit with a lot of intersections and track merging. eMel method seems tricky. Now how to join the tracks??? It seems like I'd better be doing terrain or wall curbs cause this looks like hell. - for the round part - I would rather make the road simple - even one track divided by half (as I speak of materials) and put over it curbs as objects - less polygons for sure, no merging. It should be easy, since the road seems to be flat. You could draw couple textures painted differently (white lines, tyre marks etc). - for junctions - you can create some other textures with junction picture and attach them in the places. Are the junctions going to be like 90 degrees? after couple deeper thoughts, I would definately create some objects for curbs and pavements - straight part, quarters of a cirlce inside/ouside and build from them the whole thing. That could take too much time to merge and to model everything from road profiles and also to fit textures could be hard task. And it looks fine, just the problem is textures are not wrapped in the curb line but are acually standard terrain planar.. And there is no way to change it.. So thats the bad side of this method..
Also I tried the "wall" method on my other little "test track" and I'm getting terrible collision detection in rfactor... the wheels fall through curbs (even if I checked it to be "driveable on") so that's no way. Here you go - I tried to make it simple. Unzip to "My Projects" and add Default XPack to the project's "XPacks" folder. 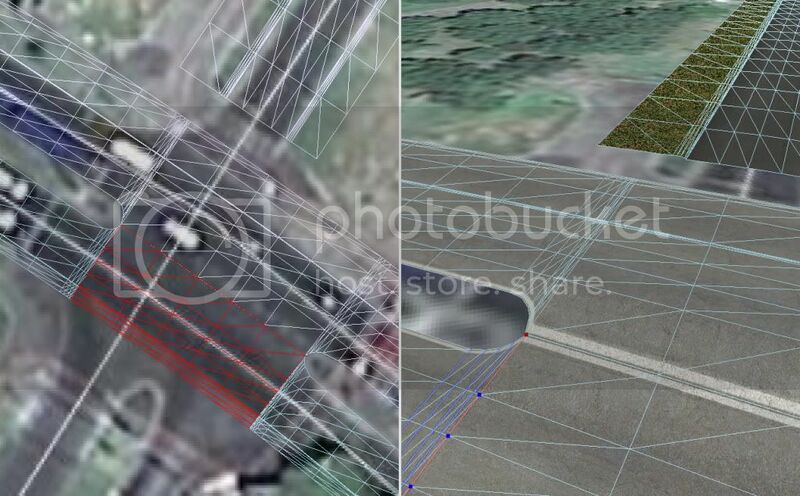 The texture could be better for sure... For this example, I would put objects (curbs) over the roads. I've set the surface as "roada" for the whole texture, so it will work in rF too. Oooooh! Thanks! That's a very nice trick =) but... I am looing for something more physical. Curbs are 10cm - 20cm high on my track.. That's a big impact on driving. I made an sobject curb, but its collision detection is actually nothing better than wall.. The problem is not the face side, but just the small scale of it.. The curb "box" is 10cm x 10 cm, and I was expecting rfactor to handle the collisions perfectly =) stupid me! Of course it can't the engine was not really designed for THAT precision. I have decided what to do.. I'll just use the hybrid method! I'll make curbs somewhere with road, somewhere with terrain. And since texturing these curbs would be pain in the ***, I will just make an sobject over the ugly edge, but without collision just for eyecandy =) collision will be handled by road/terrain below. I hope it will look great! heh - physical curbs should be made as physical objects - in Sketchup or Max or other programs - they don't need to be high-poly They could have added some transparent material which would make them more collidable and phisically higher than they would appear.